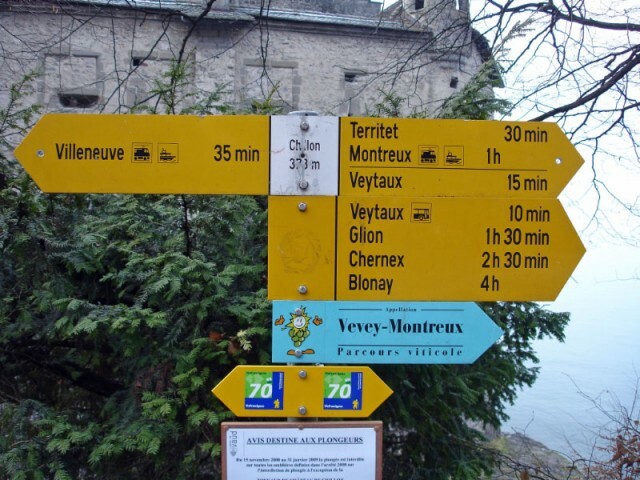 Getting to Chateau de Chillon near Montreux on Lake Geneva is easy by car, bus, boat, train, bicycle, or on foot. Chillon Castle is the most popular historic monument in Switzerland and a great day trip from Geneva, Lausanne or the Alpine ski resorts. Chateau de Chillon Castle is beautifully located on a small rocky islet in Lake Geneva. The fortress is 4 km south of Montreux and 2 km north of Villeneuve making these two towns the hubs for reaching Chillon from other parts of the Lac Léman region and the rest of Switzerland. 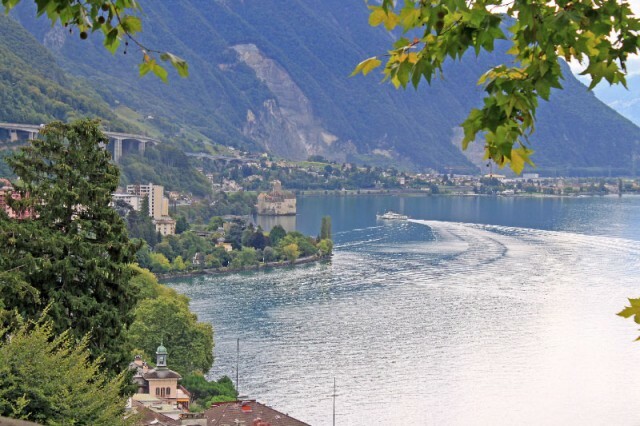 It is easy to get to Chillon by car, boat, bus, or train but hiking and cycling are also pleasant options with paths mostly following the shores of Lake Geneva from either Montreux or Villeneuve to Chillon. Many tours also include a visit to Chillon while castle tickets are available online too. Visiting Chateau de Chillon Castle is easy – a small drawbridge, guarded only by the ticket office, gives access to the islet from lake shore. Online tickets save time. Getting to Chateau de Chillon Castle is very easy as the fortress is right next to a major road and railway line. CGN Lake Geneva boats also frequently calls at the castle to provide the most romantic transportation. 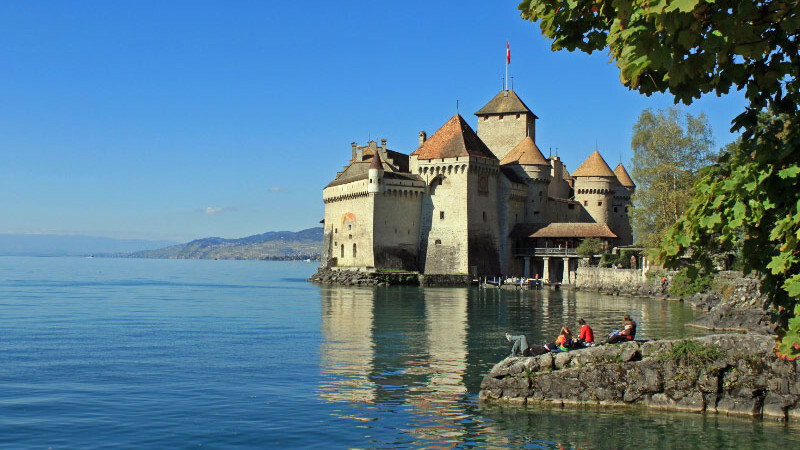 Hiking and cycling are also appealing options for getting to Chillon Castle. The main entrance to Chateau de Chillon is via a roof-covered bridge across the railway line. A second entrance is further down the road towards Villeneuve via an underpass but most visitors would find the main entrance more useful. Admission is only paid at the drawbridge leading to castle making it worth to stop over for a closer peak when passing by even if not planning to visit the castle itself. Many picnic spots are available on the lakeshore – bring own supplies or buy from the small souvenir shop in front of the castle. An old fashioned Swiss restaurant is just down the road towards from Montreux from Castle Chillon. Getting to Chateau de Chillon by car is very easy. The castle is right next to the lakeside road connecting Montreux and Villeneuve. Free parking is available on either side of the road. 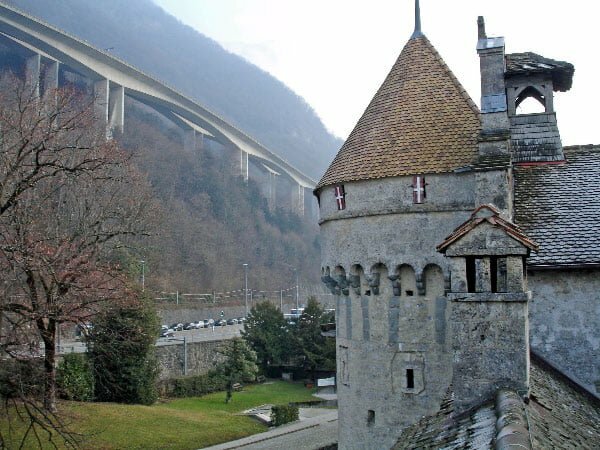 From Autoroute A9, which passes right above Chateau de Chillon, use either the Montreux or Villeneuve exit. 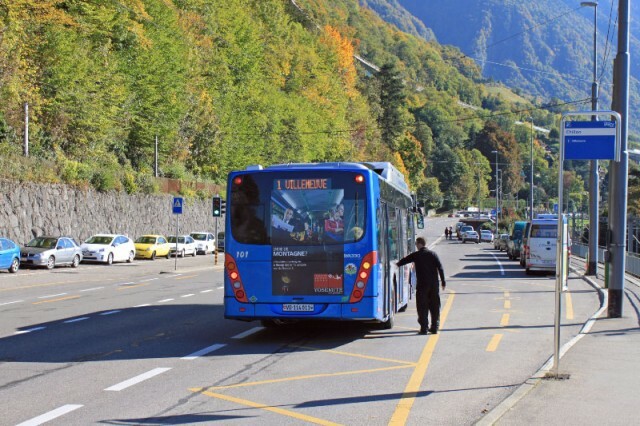 Traffic often crawls through Montreux making the route via Villeneuve generally the faster option even when arriving from the Lausanne / Genève direction. Buses and trains provide easy access to Chillon Castle from either Montreux or Villeneuve. Buses stop directly in front of the castle while trains require a short walk. See Swiss Railways for online timetables including all forms of public transportation including trains, buses, and boats. 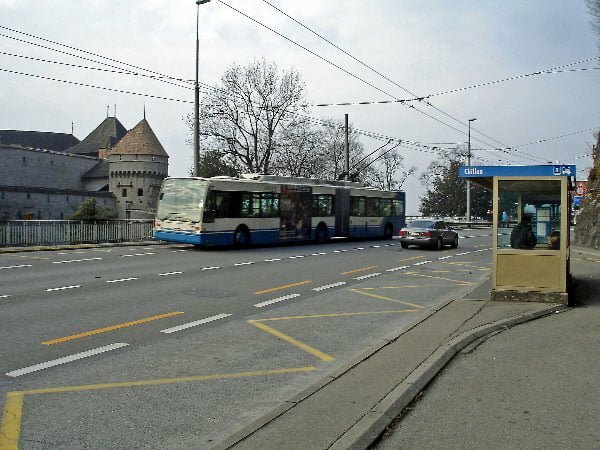 Bus Line 201 provides transportation to Chillon Castle from Vevey (30 minutes), Montreux (10 minutes), and Villeneuve (5 minutes). The bus runs generally every ten minutes but even during quieter times at least three times per hour. Buy tickets on the bus or from vending machines at major stops – not all transportation passes are accepted on the bus. The railway line passes directly next to Chateau de Chillon but the closest station to the castle is Veytaux (Chillon is sometimes added to the name). From here, it is a short, ten-minute walk next to the lake in the direction of Villeneuve. Veytaux is two stops (4 minutes) from Montreux and one stop (2 minutes) from Villeneuve. S-Bahn line S1 stops at Veytaux. S1 runs from Yverdon-les-Bains via Lausanne, Vevey, and Montreux to Villeneuve. If arriving by train from other parts of Switzerland, it is usually fastest to change to the S1 in either Montreux or Villeneuve. Changing here to the bus is also a good option, as S1 generally runs only once per hour. CGN Lake Geneva boats and steamers provide the most romantic transportation to Chillon Castle. Boats frequently call at the castle during summer but during the winter cruise season usually only on weekends. Traveling times to Château de Chillon by CGN boat are around 40 minutes from Vevey, 15 minutes from Montreux, and 10 minutes from Villeneuve. The boat landing is just to the south of the castle. Chateau de Chillon Castle is also at the far end of the Grand Traversée de Lavaux hiking trail that goes from Lausanne-Ouchy via the UNESCO World Cultural Heritage listed Lavaux vineyards.